I'm so sorry, these pictures really are not the best, but we were nearly done eating this banana cake and I suddenly realized that I needed to get it photographed quickly before it was gone, and these days, the light is really really poor in my kitchen. Darn you grey clouds. Ok, I will attempt mightily to avoid complaining the weather in each and every post. It's not even that bad yet. This recipe is a Pinterest creation! I pinned it and then I made it! (original recipe here) Yay for me! But more importantly, yay for all of us, because some of you are gonna make this lovey of a cake and then you'll be as happy in your tummy as I was when I was eating it. I don't know if anyone else recalls a banana cake made by Sara Lee. Sara Lee sells different items regionally. Well waaaay back in the day, they made some frosted cupcakes and a banana cake, and both of these offerings were divinely delicious. 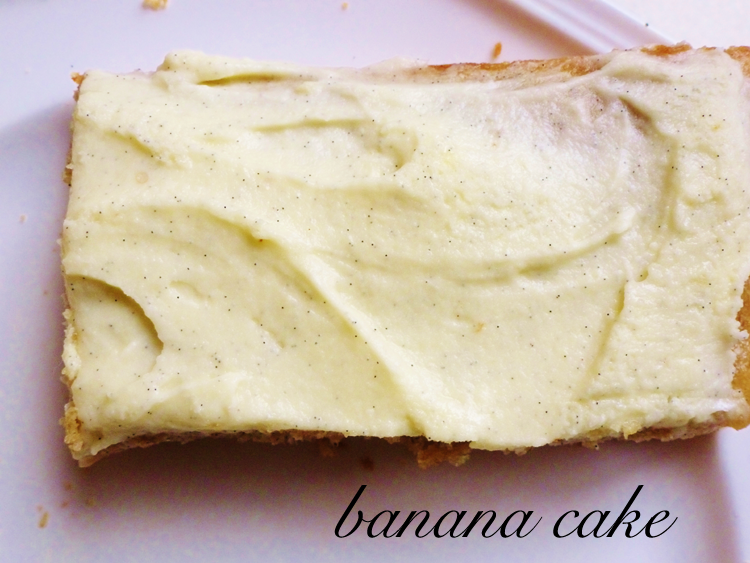 This banana cake reminds of that banana cake, and it's a taste I never thought to have again. I was a teensy dismayed when I baked the cake and took it out of the pan. It's a bit...flat. Not a tall rise, as there is only one egg and not much rising agent. If you wanted some tall, fluffy creation, you'd have to double the recipe and make it into a layer cake, which would not be hard at all to do. But really! Julia took a bite and then did a doubletake. My friend asked for seconds. ANDREW ATE IT happily and he doesn't like cake, remember? This cake was utterly delightful, (which as some of you know, that's my favorite word, next to awesome) and is pretty much the highest praise I can bestow upon something. I'm going to stop going on and on and just give you the recipe. Cake may be mixed by hand. Preheat oven to 375 degrees if using a metal 8 x 8 pan, 350 degrees if using a glass pan. Cream together butter, sugar, sour cream, and egg. Add vanilla and mashed bananas. Add flour, salt and baking powder ~ mix well. 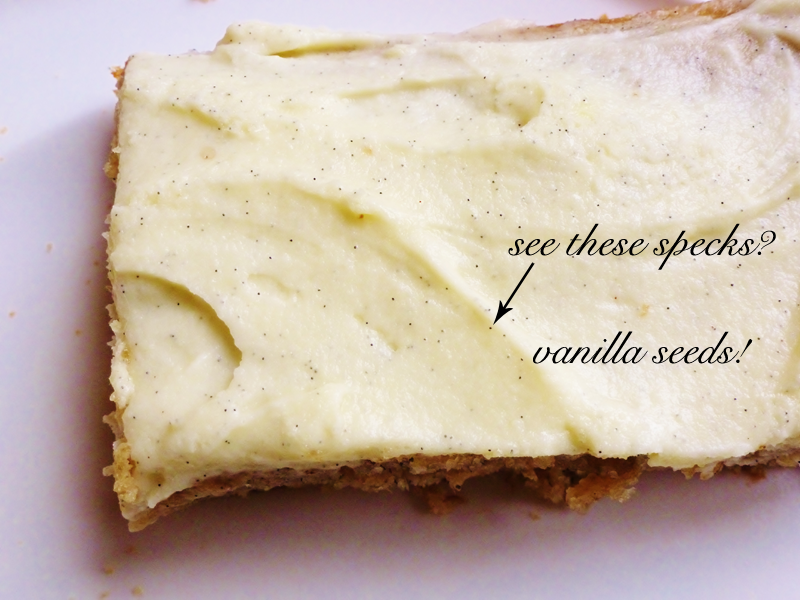 Bake for 20-25 minutes until a tester inserted in middle of cake comes clean. Cool completely before frosting. Cream butter and confectioner's sugar until smooth. Slowly add heavy cream, mix until smooth. Stir in vanilla until incorporated. Spread on cooled cake. I can't wait until I can make this again! I wish I could say I like anything banana, but alas... bananas and I are not friends. That said, it's a lovely looking cake. Moist. Gooey frosting. Vanilla flecks. Looks like you hit a home run! I know that her recipe was torn out of a magazine years ago. She brought it over for me once. It was probably from the '50s or '60s, and had a great graphic of a banana on it. Awesome real vanilla bean! YUMMMMMMM!!!!! !